As promised earlier this year, Neurable has introduced limited beta of a Unity-compatible software developer's kit (SDK) for its brain control interface (BCI) for augmented and virtual reality. The startup, birthed at the University of Michigan, takes a machine learning platform to interpret user commands from their brain activity. This gives developers the option to replace point-and-click and hand-gestures interfaces with brain control for scrolling menus, selecting items, launching applications, interacting with content, and entering text. "The benefits of a BCI in mixed reality are many and unique. BCIs analyze patterns of brain activity to determine user intent," said Michael Thompson, vice president at Neurable, in a blog post. "Such intent-driven interactions hold tremendous promise for mixed reality environments, where current problems with user interaction constitute a significant barrier to more widespread adoption." Neurable is banking on the expectation that hardware makers to begin incorporating electroencephalogram (EEG) sensors into their devices. "Facebook's presentation on BCIs at the F8 conference provided strong evidence that Facebook sees tremendous potential for BCIs in consumer tech products," said Thompson in an email to Next Reality. 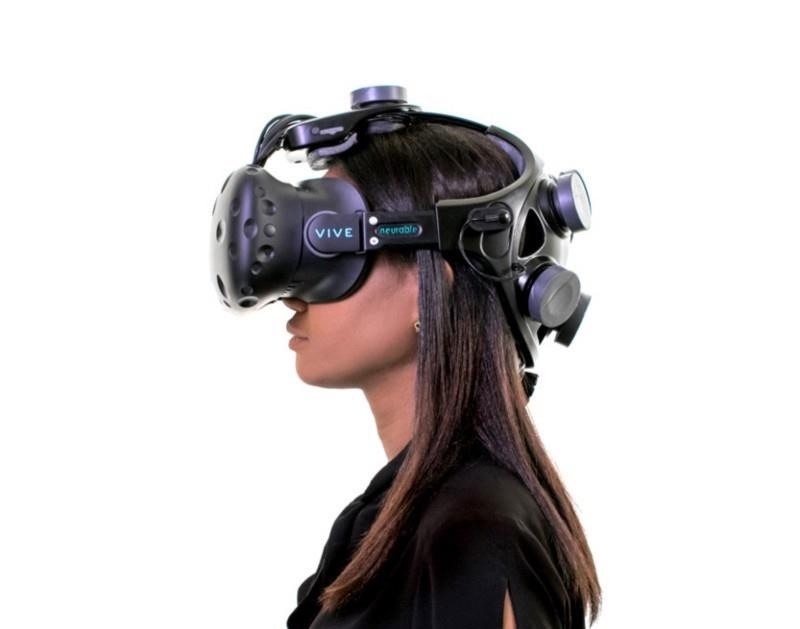 In the meantime, Neurable is offering a headband made for the HTC Vive. Equipped with seven dry-electrode EEG sensors sampling at a rate of 300Hz, the headband can transmit over Bluetooth or USB with an 8-bit digital trigger input. Like the SDK, it is compatible with Unity as well as C# and C++. "In the long run, we expect that AR/VR headset companies will integrate brain sensors directly into their products. They will do this because BCI systems radically empower users in mixed reality," said Thompson via blog post. "What the touch interface became to smart phones, BCIs will become to mixed reality headsets." In an email to Next Reality, Thompson noted that Neurable chose to begin with the Vive because it was the easiest headset for which to attach the customized headband. Neuarable plans to support all major augmented and virtual reality headsets, likely through third-party partnerships. Neurable will showcase its technology through a virtual reality game, Awakening, at SIGGRAPH 2017 in Los Angeles later this week. Developed with eStudiofuture, the game's premises gives players telekinetic powers; they control objects and fight enemies with BCI. While the beta is limited, Neurable plans to issue a broader release of the SDK in 2018. Candidates can sign up at Neurable's developer page.